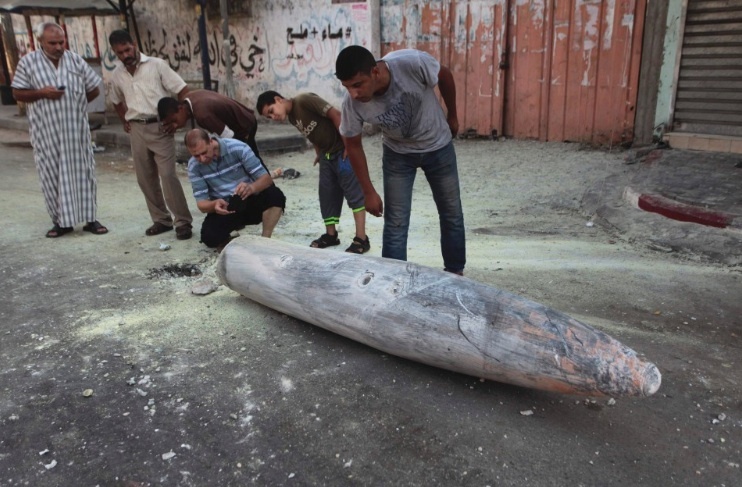 Are these traumatized Israelis examining a Qassam rocket lobbed by Hamas from Gaza? No. It’s documentation of Israeli war crimes against Gaza–& it isn’t the only evidence, which mounts in photo after photo of Israeli aircraft exploding massive bombs over Gazan cities with homes, schools, clinics. These are in fact Palestinians in the town of Deir El-Balah (on the coast of central Gaza) examing a missile dropped from Israeli aircraft. One would hardly take present international law as a guide to the oxymoronic (with emphasis on moronic) “humanitarian conduct of war”. But Israeli bombing of Gaza violates umpteen international treaties about bombing civilians & civilian property. And it must be remembered, every single person in Gaza is a civilian because there is no form of military & homemade rockets are no form of self-defense against one of the most sophisticated military arsenals in the world. Deir al-Balah, which has a nearby refugee camp, is a frequent site of Israeli military incursions by land & by air because of its location & because it is a center of political opposition to Israeli apartheid. Israeli bombers & bulldozers have razed acres of orchard land in the area; tanks have occupied the area under the pretext of routing out Hamas arsenals shooting off rockets to Israel. Since in several decades of military incursions in the region Israel hasn’t been able to rout them out, maybe it’s a failed military strategy–or more likely, those arsenals don’t exist & never existed at all. Deir al-Balah was once a center of Zionist settlements but under the despicable prime minister Ariel Sharon, Israel implemented a disengagement plan in 2005 & forcibly removed the Zionist settlers from Gaza. It now seems evident Israel’s strategy was not to generate peace between Israel & the bantustate of Gaza but to isolate Gaza to more effectively bombard it, ethnically cleanse it of Palestinians, & return it to Zionist freebooters. Many Palestinian supporters around the world are traumatized watching the carnage & feel helpless to stay the hand of Israeli genocide. Maybe that partially explains why the antiwar movement is so weak: because military power is so daunting & seemingly impregnable. But we must never underestimate the power of resistance, of political education, of persistence. Our strength lies in numbers & in commitment & in steadfast solidarity with Palestinians, Afghanis, Iraqis, Pakistanis, & all others. Photojournalists are documenting Israeli human rights & war crimes in Gaza, including hundreds of tons of explosives raining down on cities. While the photographic testimony is massive & irrefutable, world media tries to turn the story on its head with headlines like “Israel under renewed Hamas attack” (BBC, July 8th); “Israel Continues Offensive in Gaza: Gaza Raids a Response to Palestinian Rocket Attacks on Israeli Towns” (Wall Street Journal, July 9th); “Israel and Hamas trade attacks” (NY Times, July 9th). Shame-faced lying is the nature of media reporting on Israel & the Palestinians. If they could put a soundtrack to their pile of lies, it would be Andy Williams singing “The Exodus Song (This Land is Mine)” from the film justifying the expropriation of Palestine with paramilitary death squads & colonial hatred. The ABC news reader Diane Sawyer, who has made a career for herself croaking lies for the Pentagon, actually borrowed film footage of bombing carnage in Gaza & described it as Israel. There is no actual footage because there is no carnage in Israel comparable to the ethnic cleansing siege of Gaza. They’ve only been able to produce a few photos of Israelis cowering from sirens & a couple photos of property damage in Israel, allegedly from Hamas rockets. Media publish the photos & try to counter their impact with captions. 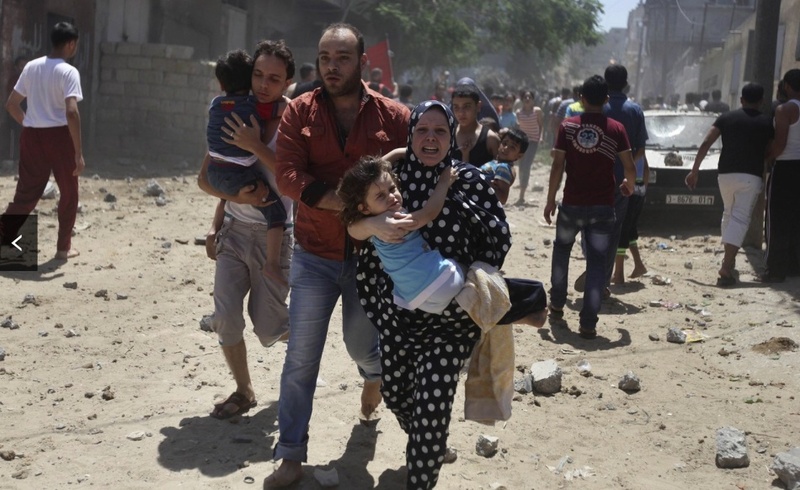 The Wall Street Journal album of carnage in Gaza used captions like: “At least 66 Palestinians have been killed so far, more than 50 of them civilians.” Since Gaza does not have any form of military they are all unarmed civilians–but the caption suggests Hamas militarism. Photo after photo of rubble in Gaza, of people running from air strikes in residential areas, of Israeli aircraft bombing cities are described in captions as “what police claimed was from Israeli bombing”–like it was just allegations from Palestinian authorities. What about what the Israeli military brazenly calls Operation Protective Edge? They bomb the hell out of Gaza & leave it to world media to cover for them. The caption to this photo read: “A Palestinian woman runs carrying a girl following what police said was an Israeli air strike on a house in Gaza City.” You can stick any caption of lies on this photo & dramatize it with Andy Williams singing, but the overwhelming weight of evidence is that Operation Protective Edge is a massive Operation Ethnic Cleansing of Palestinians by Israel. Those who want to stand on the side of ethnic cleansing using cynicism & mysticism, claiming the disputes are ancient or even genetic to semites, shaking their naughty fingers at both sides, ought to hang their heads in shame. 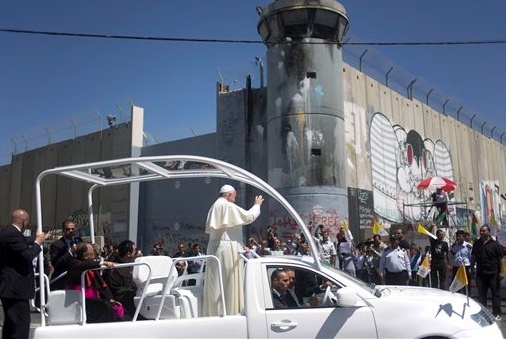 Call me ungrateful, but I think the Pope Francis trip to Palestine & Israel is a mixed bag of symbolic gestures–like visiting Mahmoud Abbas & the West Bank, praying at the apartheid wall, & visiting Al-Aqsa mosque. Like all symbolic gestures, these are not meaningless but what they signify are evasions of Palestinian justice. They’re a political dog & pony show. What matters is that he is promoting a bantustate solution, is not calling for the right of return for Palestinian refugees, & not denouncing the West Bank occupation or siege of Gaza. So what if he says a prayer at the apartheid wall!? It may rile Israel but it won’t advance Palestinian justice one iota. Pope Francis isn’t a rookie to politics & neither are his Vatican advisers. Millions of people around the world are outraged by Israeli apartheid & ethnic cleansing & the pope can get away with a wimpy-assed prayer & be lauded for it? Some may call that incremental progress toward justice for Palestinians. Let’s call it what it is: a shameful deference to Zionism & maybe collusion. Tear down that apartheid wall! No military aid to Israel! Support Palestinian justice by boycotting all Israeli products (barcode beginning 729), & supporting the cultural boycott of Israel. May 15 marks Palestinian Nakba (Catastrophe) day. 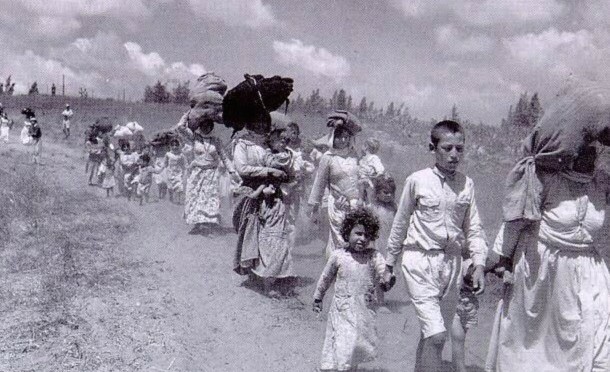 In 1948, over 780,000 Palestinians were forcibly driven from their homeland by Zionist paramilitary terrorist squads under the protection of the British. Over 500 Palestinian villages were depopulated & destroyed. Nakba day follows the day Zionists celebrate as Israeli “independence” day. That is a linguistic deceit to mask the political barbarism of Nakba. 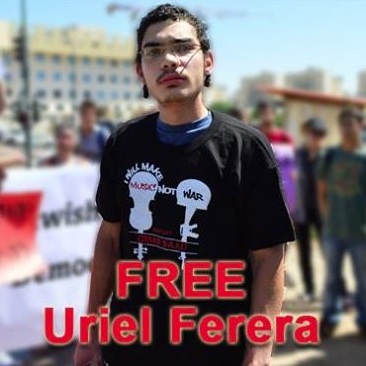 This is the defense case of Uriel Ferera, a young Israeli man jailed & placed in solitary confinement for refusing to serve in the Israeli military because he opposed discrimination against Palestinians within Israel & the occupation of Palestinian lands. Ferera is a harbinger, part of the advance guard among Israeli youth turning against the fortress of Zionist apartheid. Active solidarity with him is imperative. It serves first to protect him from worse punishment by the Israeli regime & secondly, to strengthen resolve among other Israelis who object to apartheid but are afraid to stand up because of punishment & ostracism. We should never underestimate how terrifying such commitment to justice can be; it proved hard enough for antiwar soldiers in the US Army whilst there was a massive antiwar movement & much more so in a militarized society like Israel with very weak antiwar opposition. Simple acts of solidarity show them they do not stand alone. This link suggests several easy ways to extend support to Ferera. Please take a moment to send an email voicing your objections to his incarceration, putting the Israeli regime on alert that their conduct toward him is being watched, & expressing your support for this courageous, principled, & admirable young man. It may still be uncertain where China is headed politically since linking its fortunes to the barbarities of neoliberalism but this picture shows its headed fast in the wrong direction. 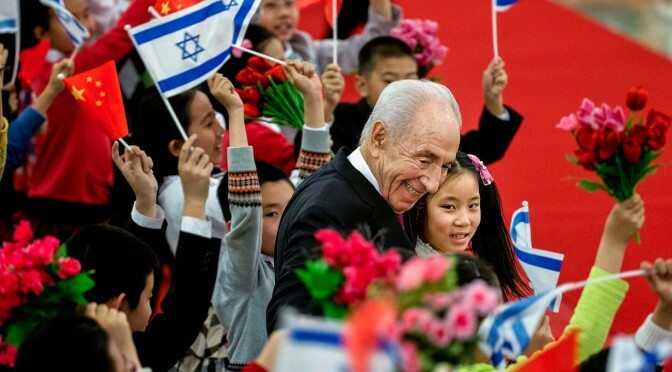 Chinese president Xi Jinping invited Israeli president Shimon Peres for a three day state visit which began today. There are no reports on why Peres was invited or what they will be negotiating but it doesn’t fare well for Palestinians that in welcoming oratory, Xi encouraged Israel in the phony Israeli-Palestinian peace negotiations. The talks have long been dead as a doornail & all attempts to slap them into life only make them look more politically obscene. You cannot bomb people & wrest their farms & cities from them while talking peace. You are either completely stupid or corrupt as hell to claim otherwise. Though in Xi’s case, he’s likely sucking up to Israel to get a better deal on military technology like the $1 billion surveillance equipment they once bought. In cringe-worthy rhetoric, Xi said the Chinese & Jewish people have always gotten along, especially during WWII when they commonly opposed fascism & militarism. Of course the falling out came after WWII with the establishment of Israel on Palestinian lands in 1948. Until Mao’s death in 1976, China’s foreign policy was based, at least rhetorically, on opposing colonialism & championing the oppressed. Diplomatic relations with Israel were not established until 1992 but Israel had a long, secretive military relationship with China since at least 1979, but probably earlier. It now has what is called a “pragmatic, flexible diplomatic strategy” in the Middle East–a term that covers a multitude of betrayals of the oppressed, & not just the Palestinians. The Jerusalem Post, a conservative Israeli newspaper, reported a few years ago that the Chinese were “allured by Israeli military prowess & by “Jewish genius” exhibited in men such as Karl Marx & Albert Einstein.” We don’t know about Einstein but we’re certain Marx would roll over in his grave at such a statement. He may have been an imperfect man, but he had no truck with such elitist ethnic chauvinism & would never have betrayed the oppressed. If there is such a thing as “Jewish genius” you sure wouldn’t know it from the Zionist propaganda machine which has been stuck on one note shrieking “antisemite” since its inception. Any extant Maoists should try to explain this disgraceful scene where innocent Chinese children are hauled out to wave flags for a country shamed before the world for its violence toward Palestinians.